Ground Zero Mosque leader Feisal Abdul Rauf has maintained a long relationship with former Malaysian Prime Minister Mahathir Mohamad, including taking Mohamad's advice on getting Malaysia more involved in the Middle East peace process, long after Mohamad's anti-Semitic and anti-American statements were widely known. 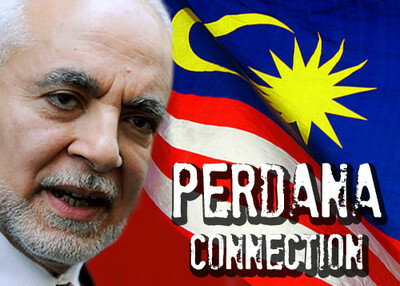 The Cordoba Initiative's website, in a recently added section, also says Rauf is not a member of Perdana: "Imam Feisal Abdul Rauf has never been a member of this group. Several years ago, Imam Feisal was invited to Malaysia, the most moderate Islamic country in the world, to participate in a Peace Conference sponsored by the Perdana Peace Group. He was one of the hundreds of speakers present. He has no political, advisory or business affiliation of any nature with the Perdana group. A photo of Imam Feisal was taken at the conference, and this has been used to 'prove' his membership in the Perdana Global Peace Organization, but the allegation is false. Because of the controversy surrounding Perdana, we have requested the Perdana Group to remove the photo of him from their publicity." The information above is TRUE ! I am a Malaysian and I can confirm that the info above, especially the link between that terrorist imam and the Malaysian government is true ! The Malaysian government supports islamic terrorism. It even has its armed forces - the Royal Malaysian Army - to teach the terrorists ways to make bombs. If that is not all, Malaysia also bought arms from North Korea and ship them to the Taliban and many other islamic terrorist groups all over the world. And if THAT is not all, in the recent United Nation assembly, the prime minister of Malaysia - himself implicated in the C4 BOMBING DEATH OF A MONGOLIAN WOMAN - is officially offering his help to Hussein Obama in ways to "fool the Americans to accept Islam". The news above have been widely covered in all the Malaysian news channels - from newspapers to TV to Malaysian websites/blogs. So watch out, Americans ! Watch out for more lies from Hussein Obama, for he is being helped by a bloody islamic murderer from Malaysia !!! They have not fooled us... We are on to them.. What they are going to do to America in the end is no different from how they have conquered all the other nations they have conquered in the past.. we will be no more free,, we will convert of die.. I live near the 9-11 mosque and see that the Islamists are getting riled up already.. More and more women are covered in BURKAS in August heat. Men in their pajama outfits.. They think they are in a more powerful position. We need to be ready to fight the fight because our politicians had no right to hand our nation over to this enemy within..
Shariah and Western law are not compatible. Can someone please explain to me why an American is carrying out a project that rates Shariah compliant nations, and is in essence promoting the implementation of Shariah? Rauf certainly appears to be an Islamist, and since he chooses to live in this country, I can only assume that he desires this nation to become an Islamic nation. TV NEWS SHOULD COMPENSATE IPT!!! Just as the 'professionals' didn't investigate Obama prior to his election, they have likewise left the real journalism on Imam Rauf to IPT and a few other concerned patriotic organizations. The TV News shows should compensate IPT for the excellent investigative work.